Nokia spokesperson Maija Taimi said that Microsoft has acquired mobile device business of Nokia and therefore handsets related queries should be sent to them, including those related to the biological safety of Nokia’s Smartphone devices. That’s the response reporters have received which are inquiring about Microsoft/Nokia’s selective funding of cell phone radiation exposure research. This occurred after proof of biological changes in skin cells were observed at below — what is now considered by the FCC as a safe level of radiation absorption at i.6 w/Kg. 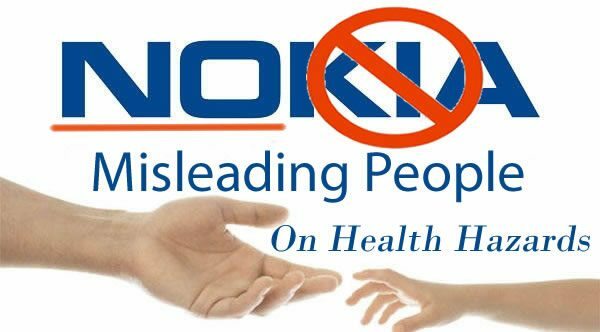 As soon as the research presented potentially negative results for the wireless industry, Nokia withheld health effects research funding from world renown scientist Dr Dariusz Leszczynski, Adjunct Professor, Division of Biochemistry and Biotechnology at the University of Helsinki and a member of a working group of 31 scientists from 14 countries constituted by the World Health Organization (WHO); which classified cell phone radiation as a group 2B carcinogen in 2011. The scientist Dariusz Leszczynski said that he was working on research for which funding was promised by a Finnish organization Tekes, where about 70 per cent funding for research is public money and rest comes from industry. “When we found that cell phone effects human body the funding stopped because cell phone manufacturers Nokia and Teliasonnera said they didn’t like it. The scientific advisory board has industry partners as members. If industry partners think research will show a negative effect, it is often not funded by Tekes,” he told PTI. “There is an effect from cell phone radiation emitted at present levels under current safety standards. Protein structure in human skin changes. We could not conclude whether it is harmful or not because our funding stopped,” Leszczynski said. He said his research observed changes in human skin cell structure even from a cell phone emitting radiation at a specific absorption rate (SAR) of 1.3. Cell phones with a max SAR value 1.6 and below are permitted for sale in the USA. However, the FCC safety guidelines are currently under fire as there are over 930 submissions from scientists around the world claiming that current SAR standards don’t protect women and children, nor does SAR testing address non-thermal concerns. It is very clear that deception starts even before a study begins, as soon as the funding source is determined. If it’s an industry-funded study, the results are likely to overwhelmingly favor industry. And if they don’t, confidentiality agreements typically have been signed that prevent the research from ever seeing the light of day and further funding of that research comes to a quick end – Leszczynski’s recent research partly funded by Nokia is a prime example of controlling the scientific outcome and the perception scientific studies. Leszczynski is by no means the first scientist to be railroaded by the wireless industry either! What this really means is that even if you scour the scientific literature to determine what the consensus is on cellphone health hazards, what you’ll find is an overwhelming preponderance of data in favor of the wireless industry that in no way, reflects the reality of what empirical non-bias scientific investigations suggest without funding from the wireless industry. Henry Lai is one of the first scientist the wireless industry marked to be discredited and in the word’s of Motorola “war-game” his scientific research. The Hong Kong native, Lai earned his bachelor’s degree in physiology from McGill University in Montreal and came to the UW in 1972 to do graduate work. He earned his doctoral degree and did post-doc work at Akira Horita. A shift came in 1979. Bill Guy, UW emeritus professor and a pioneer in the field of radio wave physics, offered Lai a chance to do research on microwaves through a grant from the Office of Naval Research. With Singh’s expertise now at hand, Lai decided to look at how microwaves affect DNA. Lai and Singh compared rats exposed to a low dose of microwave radiation for two hours to a control group of rats that spent the same amount of time in the exposure device, but didn’t receive any radiation. The exposed rats showed about a 30 percent increase in single -strand breaks in brain cell DNA compared to the control group. As Lai and Singh sought funding to conduct follow-up studies, word of the research began to get out. According to internal documents that later came to light, Motorola started working behind the scenes to minimize any damage Lai’s research might cause. In a leaked Motorola memo and a draft position paper dated Dec. 13, 1994, officials talked about how they had “war-gamed the Lai-Singh issue” and were in the process of lining up experts who would be willing to point out weaknesses in Lai’s study and reassure the public. This was before the study was published in 1995. Internal documents from Motorola in the 1990s point to an organized plan to “war-game” Lai’s work. When a scientist in California published results that seemed to support Lai’s findings, he lost research funding and eventually left the field. 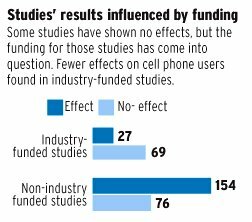 Lai’s frustration with the increasing body of contradictory research led him to do an analysis in 2006 of the available studies on cell phone radiation between 1990 and 2006, and where their funding came from. What he found was that 50 percent of the 326 studies showed a biological effect from radio-frequency radiation and 50 percent did not. But when he filtered the studies into two stacks—those funded by the wireless industry and those funded independently—Lai discovered industry-funded studies were 30 percent likely to find an effect, as opposed to 70 percent of the independent studies. Lai says that, while his findings highlight the crucial role industry funding plays in scientific research, the 50-50 split alone should be cause for concern. “Even if you accept all the industry studies, you still end up with 50-50,” he says. “How could 50 percent all be garbage?